September proved to be a busy month for our distributors around the world. Many of them were attending conferences to discuss ongoing challenges engineering educators and researchers face in their work. Quanser distributors took the opportunity to demonstrate Quanser systems that can enhance any control lab and give students hands-on experience, translating the theory they study in class into a practical and easier-to-understand real-world challenge. More than 300 Spanish engineering professors and researchers attended 32nd Jornadas de Automatica, loosely translated as Automation Days, in Sevilla. 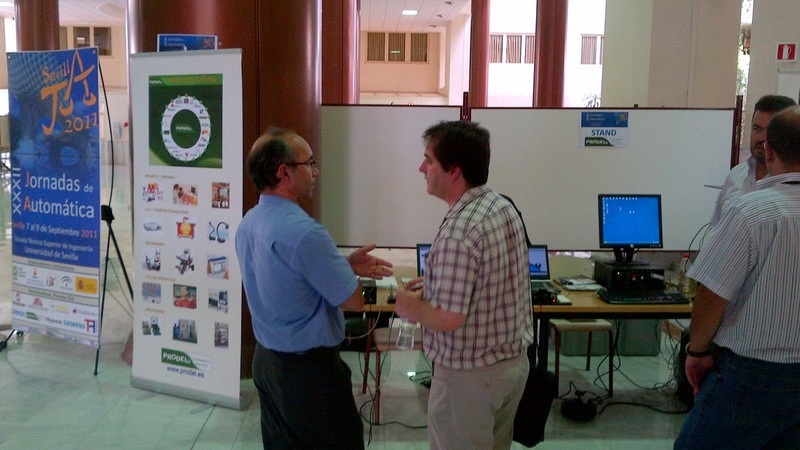 With interests ranging from bio-engineering, intelligent control and robotics to real time systems and vision control, our distributor Prodel had numerous interesting conversations with educators. This year, Prodel also brought some motion to the event, showcasing Quanser's Active Suspension system and our Rotary Control Lab Workstation with add-on modules. 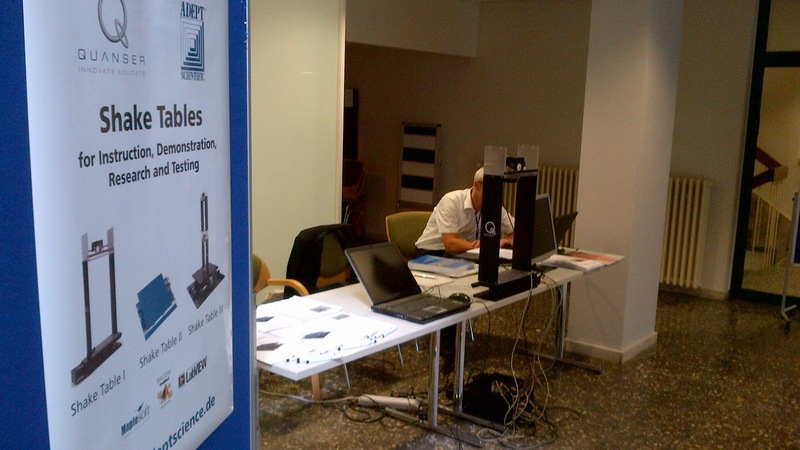 Europe's earthquake engineering professionals gathered in Hannover for D-A-CH Tagung 2011, a joint German-Austrian -Swiss Earthquake Engineering and Structural Dynamics Conference. Adept Scientific Germany, our local distributor, had an opportunity to demonstrate the most compact of our Shake Tables - the Shake Table I-40, and discuss teaching and research lab needs with the delegates. From Europe to Central and South America: in Colombia, ICL Didactica joined members of the engineering schools association, ACOFI, for their annual conference. 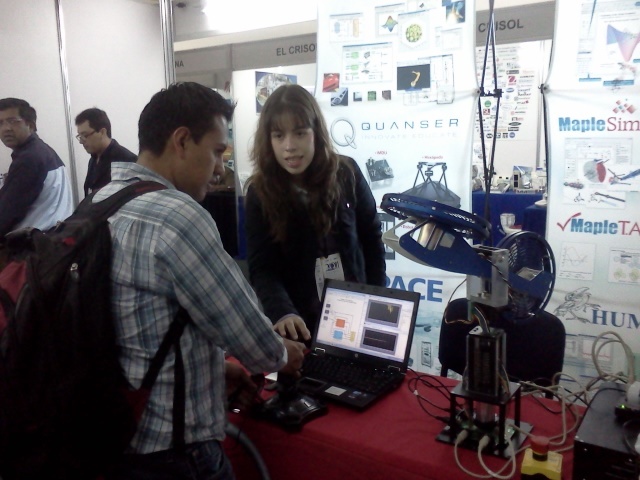 At ACOFI 2011, ICL Didactica presented some of the most popular systems for engineering labs - Quanser's QET DC Motor Trainer and Rotary Control Lab Workstation. The Mexican engineering community gathered in Pachuca for the Iberoamerican Multidisciplinary Symposium on Science and Engineering, SIMCI 2011. They were joined by our distributor, MultiON - and their booth got really busy. Attracted by the 2 DOF Helicopter experiment, engineering professors were intersted in learning about the complete workstation components, QUARC real-time software (yes, the new version QUARC 2.2. supports 64-bit platforms) and the compatibility of Quanser experiments with NI LabVIEW. Many of the professors asked MultiON to bring the live demonstration to their universities, so our distributor in Mexico will be quite busy for the rest of the year! To learn about the upcoming events in your region, and about where you can see live demos of Quanser systems, visit Events section on our website!